This photograph is a still from Soviet film footage of the liberation of Auschwitz. The film was made by the film unit of the First Ukrainian Front. 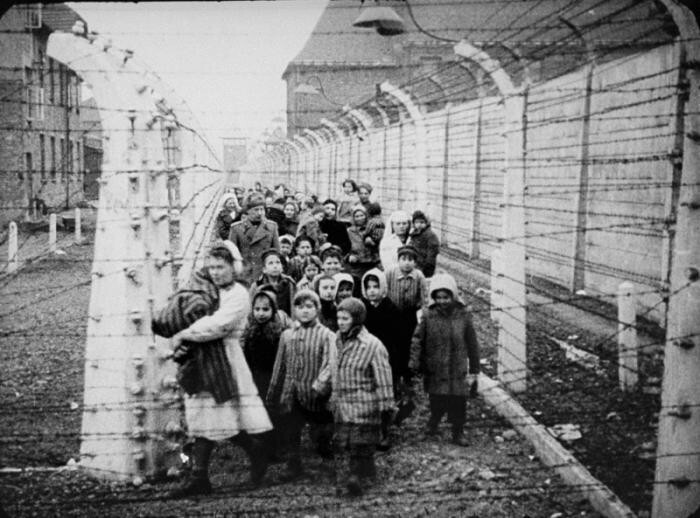 Relief workers and Soviet soldiers lead child survivors of Auschwitz through a narrow passage between two barbed-wire fences. Standing next to the nurse and behind them (wearing white hats) are two sets of twin sisters. During the camp's years of operation, many children in Auschwitz were subjected to medical experiments by Nazi physician Josef Mengele.